Yesterday, I made the drive up to the North country to get my wild trout fix. My river of choice was the Ellis river, a tributary of the legendary Saco in North Conway. This river, while small in size, is one of the hardest hit streams due to its proximity to Story Land and other popular points as well as its lengthy fly fishing only area stocked annually with large rainbow and brook trout. 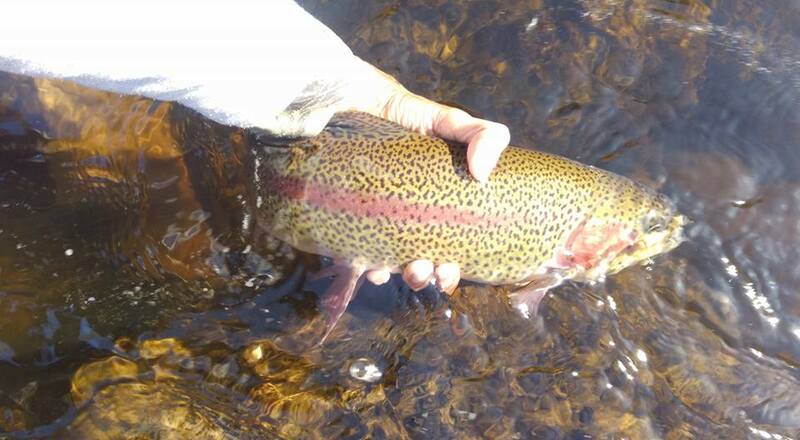 While most people pine for that area to catch larger fish and more of a variety (rainbow, brook, and the occasional stray brown from the Saco), I decided to make my way to more secluded, unpressured spots (which there are) to catch the small but energetic native gems. When I got to the river, the flows were ideal and the water was cold (possibly in the low to mid 50's) so I was glad I packed my waders. The day started off very slowly as the first few holes I fished produced nothing and the next couple produced only 2 brookies and a few very subtle missed takes. I continued working upstream, picking apart the next few holes methodically with little to no success. Just as soon as I thought that I was in for a tough day, I hooked up twice in a row! At that point, my tiny pheasant tail dropper was beat up despite its limited action so off that came and on went a larger, heavier PT dropper. This made all the difference in the world since it sank at a much faster rate and allowed me to fish Czech still with a completely tight line. After that, the action picked up and was very methodical. While the action had started off slow early on, it had now picked up to the point that I could decide where the fish were and count on them being there. Every hole, pocket, or deep riffle I fished had one or two (sometimes more) fish in it. At one point, I fished a tricky undercut with an fallen branch where I saw a brookie chase my offering downstream. When I pulled back for a back cast, the fish wasn't even spooked, it just turned and slid back into its feeding lie. I cast back into its hiding spot and I felt a take but set into the branch. As I was getting ready to free it, I felt something struggling at the end of the line! Lo and behold, the fish I was after had taken the dropper but I had pulled my line right back into the branch. As I continued further upstream, the action improved. I kept catching more little natives and found a spot where I even sight nymphed to a few! Eventually, I had to skip a lot of productive water in the interest of trying some new holes further upstream so I put on a dry and decided to skip around and see if I couple rise some fish from some of the deeper pockets. The biggest challenge was presenting the fly since there were so many cross currents but I decided on a tenkara style presentation where I used the reach of my rod to get the fly where I wanted it. I missed many strikes (mostly from YOY fish) but did manage to get a few nice fish to take. I went back to nymphing as I approached some deeper water and picked up a some more nice brookies. I ventured into a nice section full of plunge pools but only managed a few due to the cross currents, which challenged me to make a nice drift, but I did get into a few nicer ones (6 in. +) before calling it a day. All in all, it was a fantastic first trip of the year to the White Mountains (with 30+ fish caught) and I had fun despite not catching any monsters (10-12 in. in these streams). On the way home, I stopped at North Country Angler in North Conway to pick up some tying materials. For those who haven't been there, it is a nice little hole in the wall fly shop stocked to the brim with nice flies (such as the soft hackled nymphs I rave about) as well as tippet material, fly tying essentials, you name it. The staff is also very friendly and very knowledgeable about the local streams and rivers in that area. If you are interested in fishing the Saco or Androscoggin rivers, be sure to give Steve a shout, he knows his stuff! Update: I plan on updating this post or creating a new post in a week since I recorded some underwater release shots but forgot the SD adapter at home. Be on the lookout!